Grab the "reel" and steer toward the depths of Atlantic with Oak Island Fishing Charters! Off the southern coast of North Carolina comes expert fishing at its best as anglers come to tackle the waters of some of the most prized fish in the sea. We do Bald Head Island fishing with a little flair, specializing in offshore, nearshore and backwater fishing trips. With knowledge of what lies among the Brunswick Isles, our fishermen are sure to guide you towards a great catch. Our boats set sail almost everyday and we look forward to having you take part of that experience! Bald Head Island fishing was made for winners so come aboard as you'll fit right in! As avid fishermen, we take pride in knowing where to locate the fish that you seek so when participating in Bald Head Island fishing, let us know how far out you want to go as the type of fish change as the water gets deeper. Just beyond Bald Head Island are gorgeous Mahi-Mahi, Wahoo, King Mackerel, Grouper and Snapper; continue out to the deep and you come across Big Amber Jack, Grouper, Agrican Pompano and Cobia. Flowing freely and majestically is an aesthetic group of fish in which you and your team have the chance to see and catch! A maximum of six people are allowed on our 30 Contender, making your offshore trip a comfortable yet powerful one. Captain Wally services the entire Cape Fear Region so just give your captain a heads-up and he can pick you up directly from the Bald Head Island Ferry Docks. 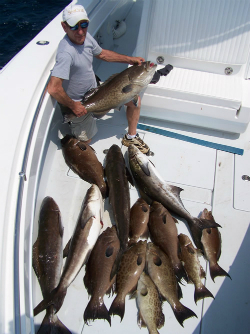 If you want to maintain the waters near the shore, that works too as we board the 19-foot Palm Beach boat to trek the waters for a wider range of species of fish which include, but not limited to: Bluefish, Flounder, King Mackerel, Spanish Mackerel and Sharks. Up to six people can take part in this nearshore adventure and let this Bald Head Island fishing trip boost your confidence as you catch incredible fish with some of the best anglers in the business. With Oak Island Fishing Charters, it's all about adding to the environment. Fishing along the Cape Fear river can be a special occasion, giving an intimate setting to an arousing experience of catching Flounder, Red Drum and Trout. Even with a relaxing backdrop, still find the thrill in this aspect of Bald Head Island Fishing. We look forward to having you for a half or full day of fishing so grab your rod and throw out a line around all sides of the island as we sail the depths of the Atlantic! Reserve a charter fishing boat by calling us today at 910.470.1995!